This page shows the ferries of the River Fal SS Co and its predecessors on the Falmouth-Truro route, plus associated excursion ships. Richard Benney, a Truro River pilot, took delivery of the steam tug Resolute in 1887. She was carvel built by Scroble & Davies at Malpas. Her original Sara engine was replaced in 1886 by one by Cox 7 Co of Falmouth. Resolute had a certificate for 70 passengers, to augment revenue from towing. In 1882, they took delivery of a second passenger tug, the New Resolute. She was again built of wood by Scroble & Davies, with an engine by Cox & Co. In addition to towing, they carried passengers between Falmouth and Truro. 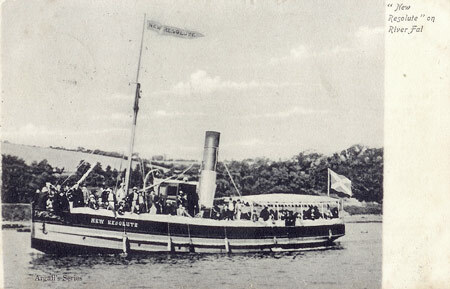 The steamers ran the service daily between April and October, calling at Malpas. As still happens today, srvics terminated at malpas at low tide. New Resolute was also used for other excursions, including sea cruises as far as the Lizard or Looe. By the 1890s, Sarah Pollock Benney had become managing owner of the vessels, and she took delivery of the Queen of the Fal (1) in 1893, built by Cox & Co and registered in Truro. Resolute was sold by the family in 1902, although she survived until lost in the English Channel in 1920. Benney steamers had french grey hulls with black gunwales, and distinctive white, red and black funnels. 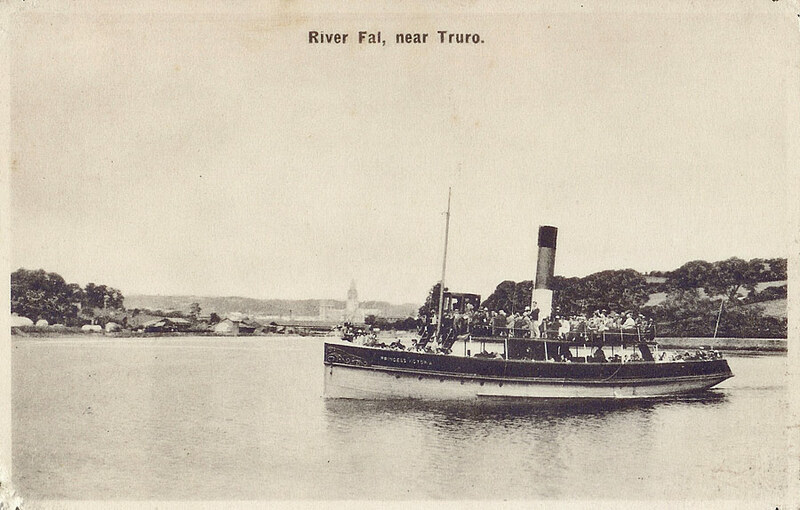 In March 1906, the New Resolute and Queen of the Fal (1) were sold to Gerald Nalder, solictor engaged in the formation of the River Fal Steamship Company (1906). The father of William John Thomas, Philip Thomas, had run tugs on the Fal since 1866. 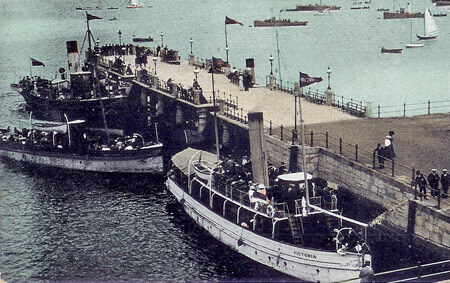 The first tug William was involved with was the Victor of 1898. Of 153 gross tons, she was more substantial than most of the local steamers licensed for passengers. 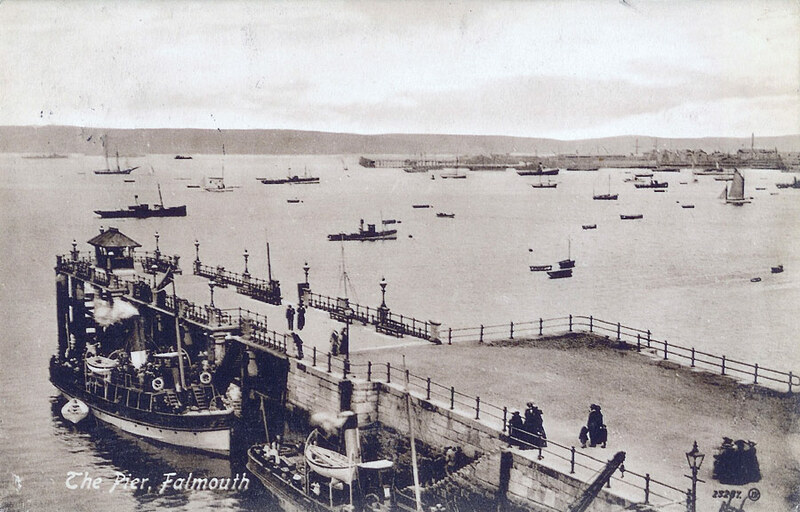 She was built by Pool Skinner & Williams of Falmouth, with a Cox & Co triple expansion engine. Shares in Victor were always held by various family members, but W J Thomas took full control from 1919, and he had managed her from building. Her large size allowed more extensive regular sea trips than most of the other local boats. 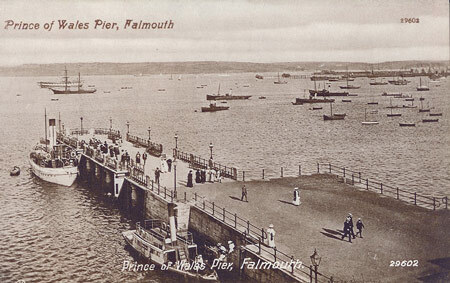 Victor continued sea excursions until 1933, by which time she was the last of the passenger tugs at Falmouth. In 1899, William John Thomas, in partnership with Arthur William Chard, ordered a second smaller passenger steamer Victoria (1), delivered in 1900 from Cox & Co. Unlike the rival Benney & Co steamers, she was twin screw with a lower draft. Within six months she was sold back to her builder Walter Cox, who had a buyer ready in Mauritious. Cox delivered the replacement Victoria (2) in 1901, also twin screw. The partners adopted the title The River Fal Steamship Company. Victoria (2) was similar to her predecessor, but had a small upper deck. Both steamers had buff funnels and white hulls. In 1905, the Victoria (2) was also sold to the Portuguese Government. Once again, a replacement was ordered from Cox & Co, becoming the Princess Victoria in the combined flee twith Benney & Co in 1907. In March 1906, the New Resolute and Queen of the Fal (1) were sold to Gerald Nalder, solictor engaged in the formation of the River Fal Steamship Company (1906). 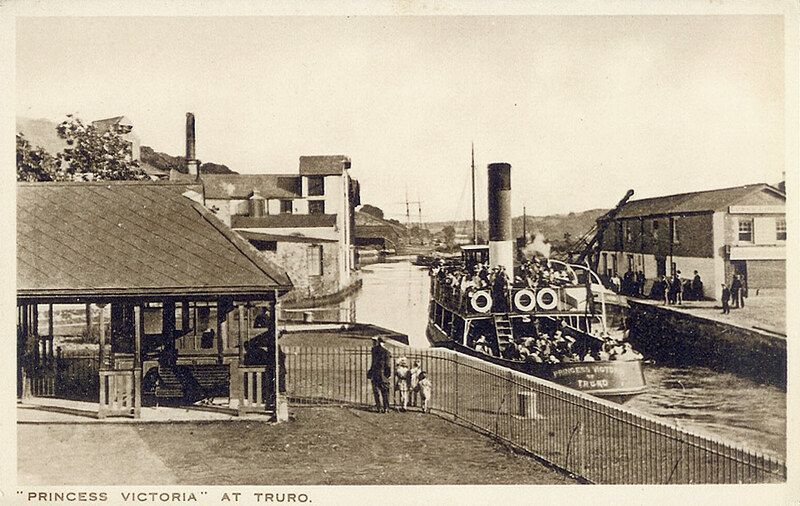 They were joined in the combined fleet by the new twin screw Thomas steamer Princess Victoria in 1907. The Benney white, red and black funnels were adopted for the combined fleet, with the white hulls of the 'Victoria' boats. These were also later changed back to the french grey and black of the old Benney fleet. 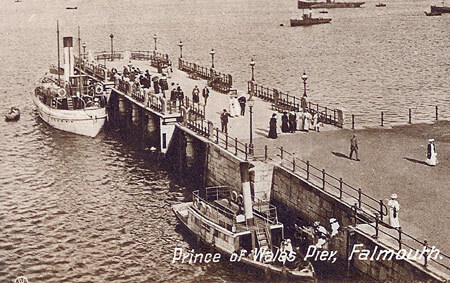 From 1905, the steamers all sailed from the new Prince of Wales Pier, officially opened in May of that year. 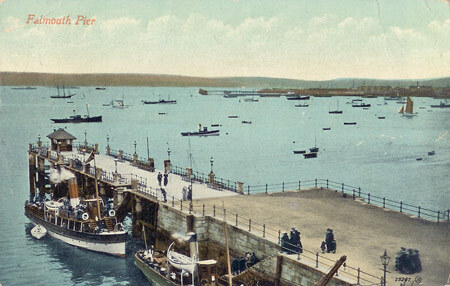 They had previously sailed from a smaller jetty at the same location, known as Market Strand. 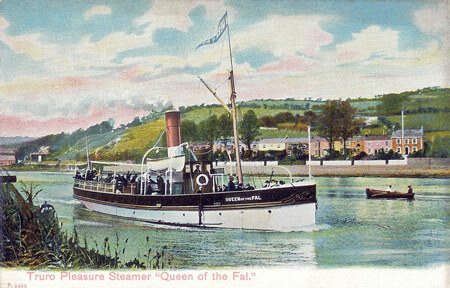 In 1911, Queen of the Fal (1) was sold for tug use on the Thames. 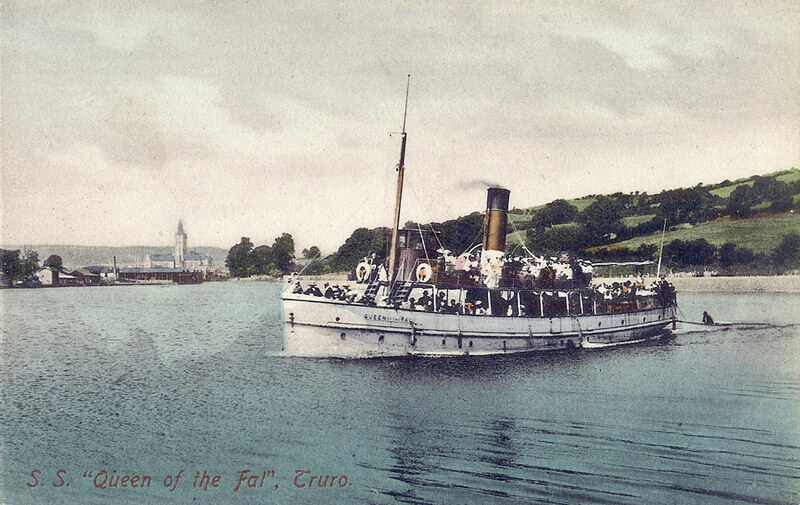 She was replaced by Queen of the Fal (2), a single screw steamer like previous Benney vessels. The deeper draft Queen of the Fal (2) took most of the coastal excursions, whilst the twin screw Princess Victoria concentrated on the truro service. New Resolute mainly ran other local harbour trips. The three vessels returned to excursion sailings in 1920 after the war. New Resolute was sold in 1927. Following the sale of the Victor in 1934, Queen of the Fal (2) was the last visitor to the Lizard. All excursion services ceased on the outbreak of war again in 1939. Princess Victoria and Queen of the Fal (2) were both acquired by the Ministry of War Transport in 1942, and never returned to the Fal. The company was subsequently wound up, and its place was eventually filled by the 'Enterprise' boats which maintain the service today. Richard Benney, a Truro River pilot, took delivery of the steam tug Resolute in 1887. She was carvel built by Scroble & Davies at Malpas. Her original Sara engine was replaced in 1886 by one by Cox 7 Co of Falmouth. Resolute had a certificate for 70 passengers, to augment revenue from towing. In 1882, they took delivery of a second passenger tug, the New Resolute. She was again built of wood by Scroble & Davies, with an engine by Cox & Co. In addition to towing, they carried passengers between Falmouth and Truro. 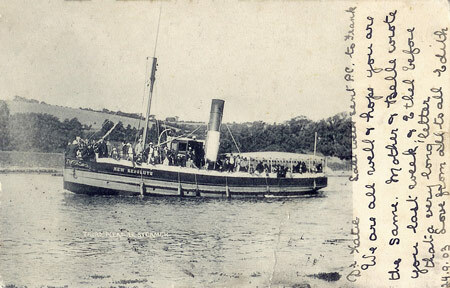 The steamers ran the service daily between April and October, calling at Malpas. As still happens today, srvics terminated at malpas at low tide. New Resolute was also used for other excursions, including sea cruises as far as the Lizard or Looe. By the 1890s, Sarah Pollock Benney had become managing owner of the vessels, and she took delivery of the Queen of the Fal (1) in 1893, built by Cox & Co and registered in Truro. Resolute was sold by the family in 1902, although she survived until lost in the English Channel in 1920. Richard Benney, a Truro River pilot, took delivery of the steam tug Resolute in 1887. She was carvel built by Scroble & Davies at Malpas. Her original Sara engine was replaced in 1886 by one by Cox 7 Co of Falmouth. Resolute had a certificate for 70 passengers, to augment revenue from towing. In 1882, they took delivery of a second passenger tug, the New Resolute. Resolute was sold by the family in 1902, although she survived until lost in the English Channel in 1920. 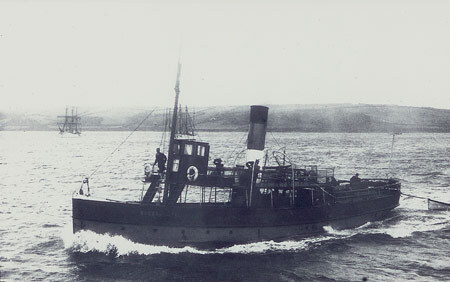 Richard Benney, a Truro River pilot, took delivery of the steam tug Resolute in 1887. In 1882, she was joined by a second passenger tug, the New Resolute. She was again built of wood by Scroble & Davies, with an engine by Cox & Co. In addition to towing, they carried passengers between Falmouth and Truro. 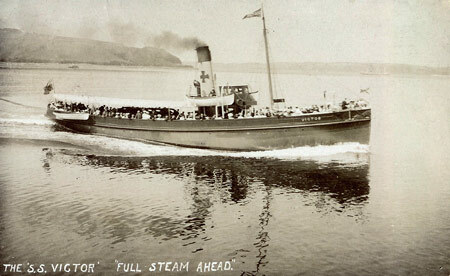 The steamers ran the service daily between April and October, calling at Malpas. As still happens today, servics terminated at Malpas at low tide. New Resolute was also used for other excursions, including sea cruises as far as the Lizard or Looe. By the 1890s, Sarah Pollock Benney had become managing owner of the vessels, and she took delivery of the Queen of the Fal (1) in 1893, built by Cox & Co and registered in Truro. Benney steamers had french grey hulls with black gunwales, and distinctive white, red and black funnels. 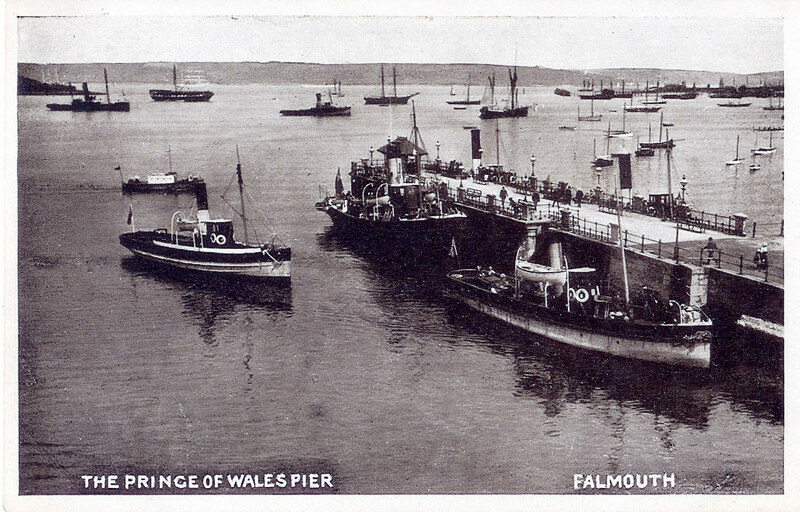 In March 1906, the New Resolute and Queen of the Fal (1) were sold to Gerald Nalder, solictor engaged in the formation of the River Fal Steamship Company (1906). 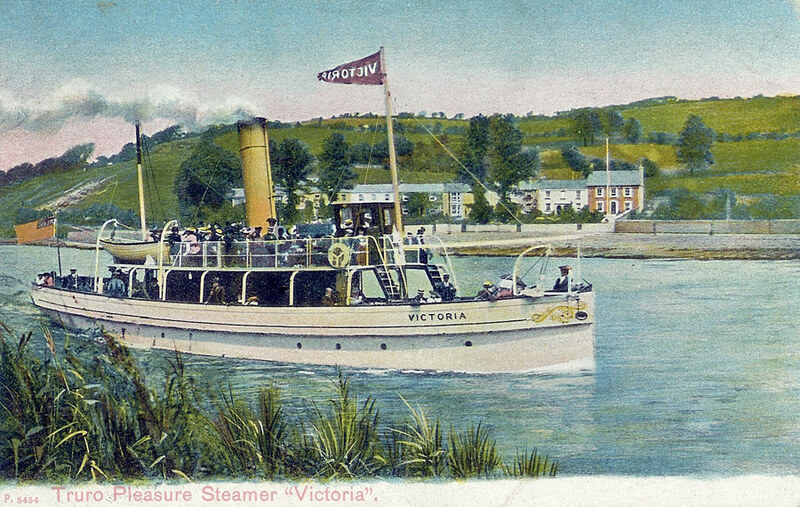 In 1899, William John Thomas, in partnership with Arthur William Chard, ordered a second smaller passenger steamer Victoria (1), delivered in 1900 from Cox & Co. Unlike the rival Benney & Co steamers, she was twin screw with a lower draft. Within six months she was sold back to her builder Walter Cox, who had a buyer ready in Mauritious. 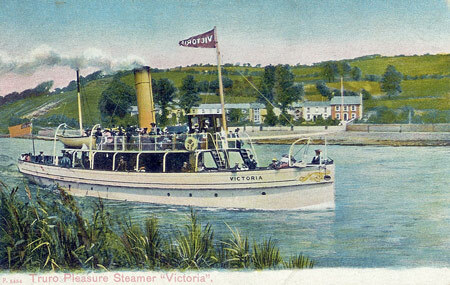 Victoria (1) was delivered in 1900 from Cox & Co. Within six months she was sold back to her builder Walter Cox, who had a buyer ready in Mauritious. Cox delivered the replacement Victoria (2) in 1901, also twin screw. 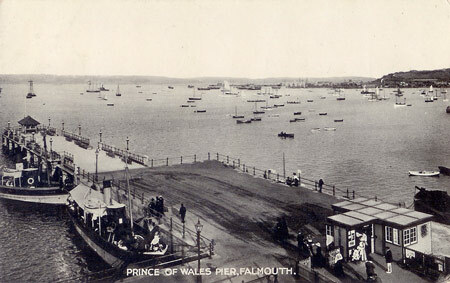 The partners adopted the title The River Fal Steamship Company. Victoria (2) was similar to her predecessor, but had a small upper deck. Both steamers had buff funnels and white hulls. In 1905, the Victoria (2) was also sold to the Portuguese Government. Once again, a replacement was ordered from Cox & Co, becoming the Princess Victoria in the combined flee twith Benney & Co in 1907. In 1911, Queen of the Fal (1) was sold for tug use on the Thames. 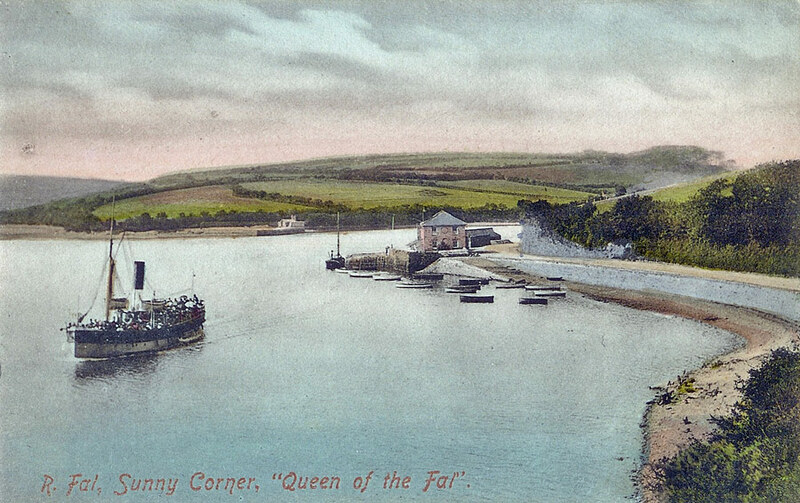 She was replaced by Queen of the Fal (2), a single screw steamer like previous Benney vessels. 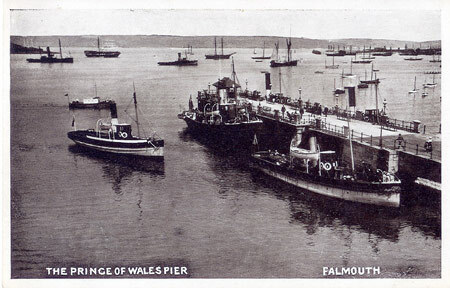 The deeper draft Queen of the Fal (2) took most of the coastal excursions, whilst the twin screw Princess Victoria concentrated on the truro service. New Resolute mainly ran other local harbour trips. 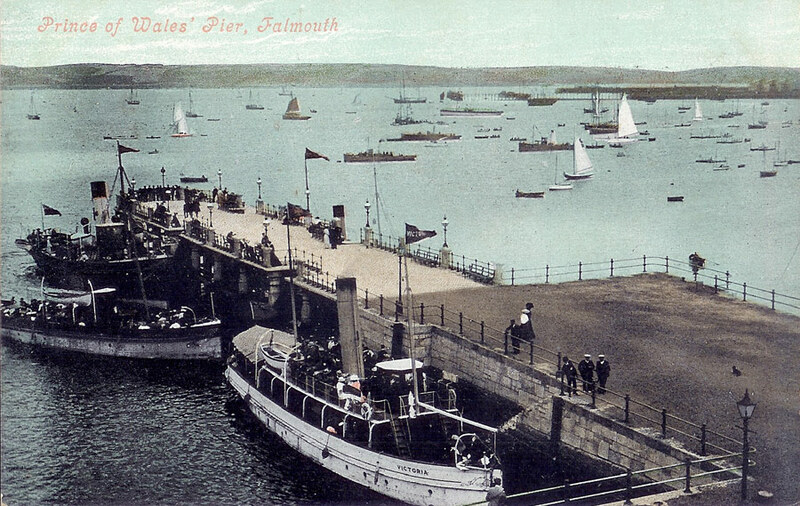 The three vessels returned to excursion sailings in 1920 after the war. New Resolute was sold in 1927. Following the sale of the Victor in 1934, Queen of the Fal (2) was the last visitor to the Lizard. All excursion services ceased on the outbreak of war again in 1939. Princess Victoria and Queen of the Fal (2) were both acquired by the Ministry of War Transport in 1942, and never returned to the Fal. The company was subsequently wound up, and was eventually filled by the 'Enterprise' boats which maintain the service today. 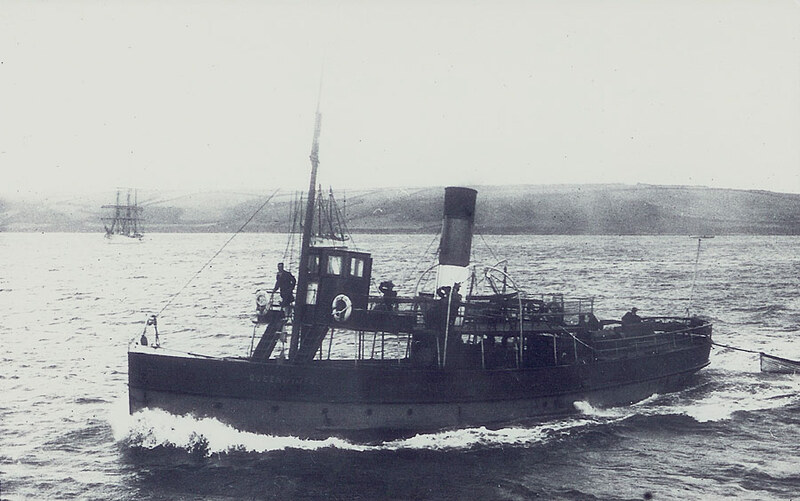 Richard Benney, a Truro River pilot, took delivery of the steam tug Resolute in 1887. In 1882, she was joined by a second passenger tug, the New Resolute. She was again built of wood by Scroble & Davies, with an engine by Cox & Co. In addition to towing, they carried passengers between Falmouth and Truro. The steamers ran the service daily between April and October, calling at Malpas. As still happens today, srvics terminated at malpas at low tide. New Resolute was also used for other excursions, including sea cruises as far as the Lizard or Looe. By the 1890s, Sarah Pollock Benney had become managing owner of the vessels, and she took delivery of the Queen of the Fal (1) in 1893, built by Cox & Co and registered in Truro. Benney steamers had french grey hulls with black gunwales, and distinctive white, red and black funnels. 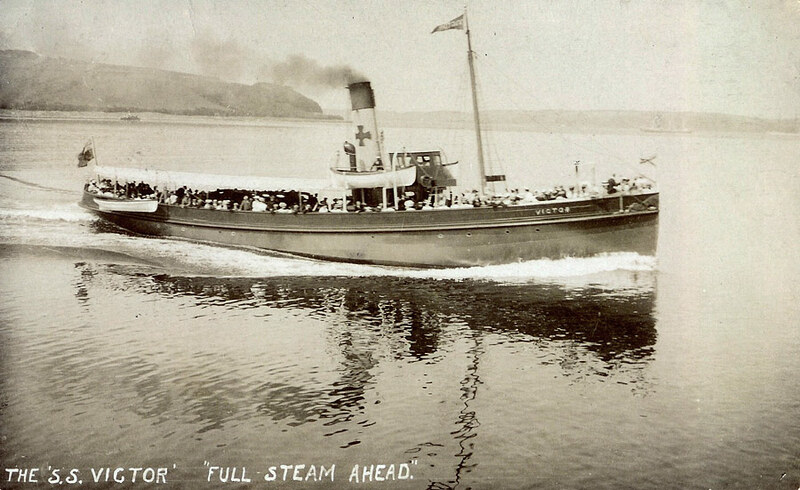 In March 1906, the New Resolute and Queen of the Fal (1) were sold to Gerald Nalder, solictor engaged in the formation of the River Fal Steamship Company (1906). 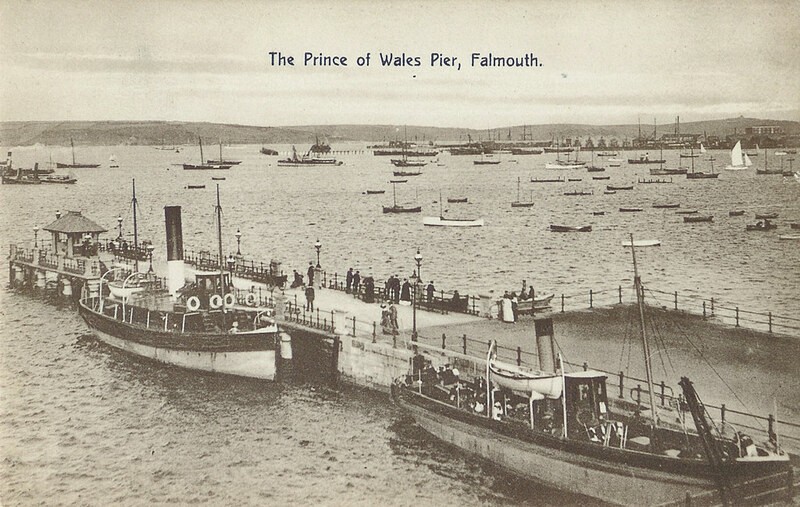 In 1911, Queen of the Fal (1) was sold for tug use on the Thames. 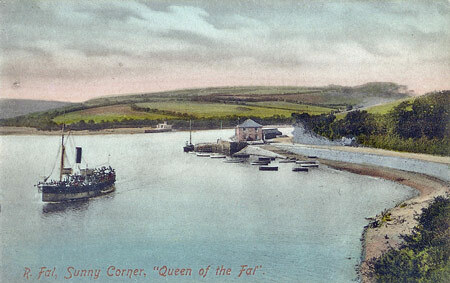 She was replaced by Queen of the Fal (2), a single screw steamer like previous Benney vessels. In March 1906, the New Resolute and Queen of the Fal (1) were sold to Gerald Nalder, solictor engaged in the formation of the River Fal Steamship Company (1906). They were joined in the combined fleet by the new twin screw Thomas steamer Princess Victoria in 1907. Princess Victoria returned to excursion sailings in 1920 after the war. All excursion services ceased on the outbreak of war again in 1939. Princess Victoria and Queen of the Fal (2) were both acquired by the Ministry of War Transport in 1942, and never returned to the Fal. The company was subsequently wound up, and was eventually filled by the 'Enterprise' boats which maintain the service today.